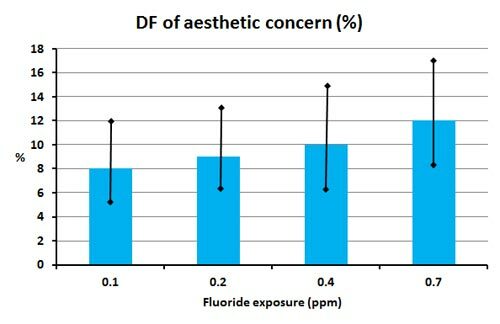 A recent issue of the Fluoride Exposed Newsletter gives us the facts about dental fluorosis – a subject very often misrepresented by opponents of community water fluoridation. Ever notice how words ending with “-osis” sound a bit scary? That’s because “-osis” is a suffix (from the Greek) commonly used to describe disorders or abnormal states. Tuberculosis, multiple sclerosis…no fun. Those are serious. Dental fluorosis is one of those things that sounds scarier than it actually is… at least if you live in a country like the good old U.S. of A., where public health and environmental protection agencies and organizations have made the scary kind of dental fluorosis (severe dental fluorosis) exceedingly rare. Dental fluorosis is a little like blood pressure. When it’s low, you’re good – in fact, mild dental fluorosis can protect your teeth from cavities. Moderate dental fluorosis describes the appearance of tooth enamel when kids get exposed to a bit too much fluoride. Changes range from barely visible white spots or streaks (in most cases) to white spots that are a cosmetic concern. Severe forms involve staining and pitting. These severe forms of fluorosis are super rare in the U.S. – because we have those protections we mentioned. In the States, we make sure fluoride isn’t too low or too high in drinking water. It’s only in regions such as rural India, China, and the African Rift Valley, where severe dental fluorosis commonly reaches an actual disease state and affects tooth health and function. But in the U.S., fluorosis is one of those things that’s not as scary as it sounds. As you may already know, fluoride gets into your tooth enamel during the remineralization process and forms a super compound called fluoroapatite that resists decay. For this reason, our dentists want us to get fluoride, ideally through drinking water and fluoride toothpaste. Or if you’re in a community without fluoridated water, there are dental treatments and dietary supplements you can get. But if a child who’s still developing teeth gets too much fluoride, dental fluorosis can occur while the teeth are still forming under the gums. Data from the National Health and Nutrition Examination Survey (1999-2004) tells us that less than one-quarter of persons aged 6-49 in the United States had some form of dental fluorosis. Note: One interesting factoid: In this study, the rate of fluorosis for teenagers aged 12-15 was forty percent! That’s significantly higher than the rate for all age groups taken together. It’s a data point we’ll be keeping an eye on in future studies. According to the American Dental Association (ADA), the mild and moderate forms of dental fluorosis we have in the U.S. do not negatively affect the health of your teeth. It’s actually even correlated with some good things. For example, rates of dental fluorosis are higher in kids whose teeth are more resistant to tooth decay. Makes sense, right? That said, we can make sure a child’s amount of fluoride is “just right” – enough to provide cavity protection, but not enough to cause visible changes in the tooth enamel. Don’t give kids fluoride supplements if your drinking water is already at or above the recommended fluoride concentration of 0.7 mg/L. You can find out if your water system fluoridates and at what level from this cool site from the CDC: https://nccd.cdc.gov/DOH_MWF/Default/Default.aspx. Or call your water utility provider. If your drinking water contains greater than 2 mg/L of fluoride, children 8 years and younger should use an alternative source of drinking water. A little less than 1% of Americans on public water systems have fluoride above this level. If you have well water, have it tested for fluoride levels, and again, use an alternative source for kids if fluoride is more than 2 mg/L. Use an alternative source for everyone in the family if it tests at or above 4 mg/L. Use only a rice-grain-sized amount of fluoride toothpaste to brush kids’ teeth if they’re younger than 3. For kids who are 3-6 years old, use a pea-size amount of fluoride toothpaste, and supervise these preschool kids when they brush so they don’t swallow too much fluoride toothpaste. So that’s it! Dental Fluorosis: it’s a scary name, but not a big worry in the U.S.
Whew! One less “-osis” to freak out about! Subscribe to the Fluoride Exposed newsletter. 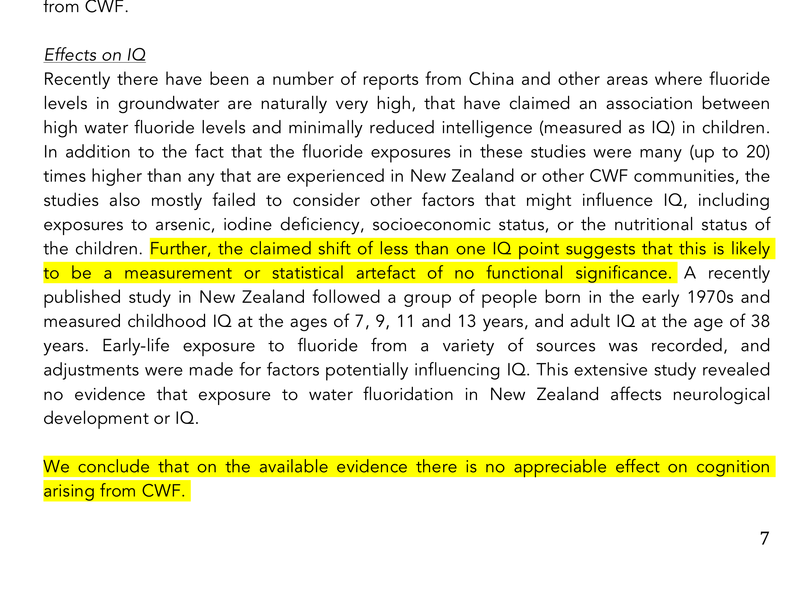 Anti-fluoridation campaigners love to cite Dr Q. Y. Xiang to “prove” that community water fluoridation (CWF) can lower IQ. Trouble is – Xiang’s research on fluoride and IQ took place in an area of endemic fluorosis in China where drinking water fluoride levels were much higher than those used for CWF. That hasn’t stopped Paul Connett from making mileage out of Xiang’s data – even though the link between IQ and drinking water fluoride shown by Xiang’s data is very tenuous (see Connett fiddles the data on fluoride). Fluoride at the concentration used in CWF does not cause the cosmetically undesirable forms of dental fluorosis. Xiang, J., Yan, L., Wang, YJ., Qin, Y., Wang, C. & Xiang, QY. (2016). The effects of ten years of defluoridation on urinary fluoride, dental fluorosis, defect dental fluorosis, and dental caries, in Jiangsu province, PR China. Fluoride, 49(March), 23–35. Yes, I know, it is published in Fluoride – which is hardly a credible scientific journal. 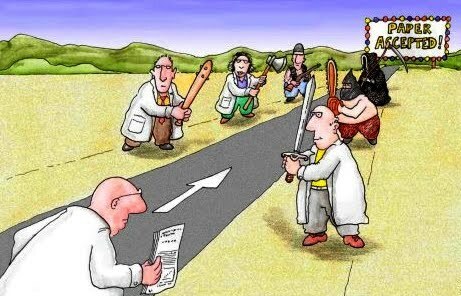 And the lack of proper peer review sticks out like a sore thumb with mistakes in the text, poor data presentation and poor data statistical analysis. This is shown by data they collected in 2002 for two villages -Wamiao (a “severe endemic fluorosis village” with drinking water fluoride in the “range of 0.57 – 4.50 mg/L”) and Xinhuai (a “non-endemic fluorosis village” with drinking water fluoride in the “range 0.15 – 0.77 mg/L”). They combined the data for the 2 villages to produce the following graphic – from which they concluded that a “possible desirable range for the fluoride level for minimizing the prevalence of dental caries” . . . [is] “approximately 1.5 – 2.5 m/L.” Considering this is just one study and has limitations the result is similar to the recommended fluoride level for CWF – 0.75 mg/L in the USA and 0.75 – 1.2 mg/L in New Zealand. OK, this is a poor graphic and I cannot see why they should have divided the data into the nine subgroups instead of statistically analysing the whole dataset (an indication of poor peer review by the journal?). But you get the picture. Dental decay declines as fluoride concentration in the drinking water in increased from near zero to about 1 mg/L. The current dental fluorosis study occurred in 2013 when the fluoride concentrations in both villages were in the range 0.85 – 0.95 mg/L. This is similar to the levels used in CWF. In 2013, the researchers found very low levels of total dental fluorosis in both villages (3.1% in Xinhuai and 8.8% in Wamiao – no significant difference). They also measured “defect dental fluorosis” – a Chinese classification which includes some “moderate” dental fluorosis and all “severe dental fluorosis as diagnosed by Dean’s criteria (see Water fluoridation and dental fluorosis – debunking some myths and the image below). The prevalence of “defect dental fluorosis” in 21013 was zero for both villages. This contrast markedly with the situation in 2002 where the prevalence of total dental fluorosis was significantly higher in Wamiao village (89%) than in Xinhuai (4.5%). The prevalence of “defect dental fluorosis” was 39% in Wamiao but zero in Xinhuai (data from Xiang, et al., 2004). The 2013 data reported in this paper confirm what I have said again and again in articles here. CWF does not cause the cosmetically undesirable forms of dental fluorosis – the “moderate” and “severe” forms, or the “defect dental fluorosis” in the Chinese classification). 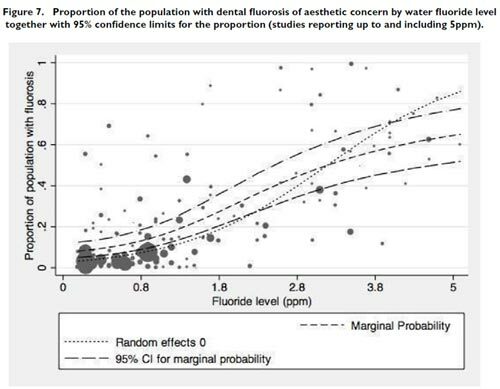 Anti-fluoride campaigners always misrepresent this data by quoting figures for total dental fluorosis and claiming the effects are those only seen with “moderate” and “severe” forms. The new water supply in these two villages has solved the dental fluorosis problem while also maintaining a fluoride concentration comparable to that used in CWF and helping support a low level of dental decay in children. The data support other findings (and the current scientific consensus) showing that CWF does not cause any cosmetically undesirable dental fluorosis but does help prevent tooth decay. Once more on the IQ and fluoride myth – why ignore other factors? The “fluoride damages IQ” myth won’t go away – mainly because it is avidly promoted by campaigners against community water fluoride (CWF). This is despite the fact that no link has even been drawn between CWF and IQ (the only relevant study shows no connection). But that doesn’t stop ideologically driven campaigners who rely on poor quality studies from areas of endemic fluorosis where dietary fluoride intake is higher than in areas using CWF. Kundu, H., Basavaraj, P., Singla, A., Gupta, R., Singh, K., & Jain, S. (2015). Effect of fluoride in drinking water on children′s intelligence in high and low fluoride areas of Delhi. Journal of Indian Association of Public Health Dentistry, 13(2), 116. The supporting data is poorly presented and described – for example, no indication is given of the fluoride concentration in the drinking water of the “high fluoride and “low fluoride” areas used. Although they do cite areas in Delhi (where the study was located) with fluoride concentration as high as 32.5 ppm!. And I cannot find any details on “mothers diet during pregnancy” (except perhaps division into two groups – “routine” or “special diet as suggested by the doctor during pregnancy”). These sorts of studies almost always rely on finding a statistically significant difference in the IQ values of children in two different areas or villages. But that statistical significance says nothing about the causal factors involved – it may have nothing to do with differences in fluoride levels. Kundu et al., (2015) do at least include some data on confounding factors which is often missing from such studies. These show significant difference between the groups from the “high fluoride” and “low fluoride” areas which have no connection with fluoride in drinking water – such as father’s occupation, mother’s education and father’s education) – or only an indirect connection (dental fluorosis). You get the picture. The areas were chosen according to the concentrations of fluoride in drinking water (whatever they were), but they could equally have been chosen on the basis of parental education, father’s occupation or prevalence of the more severe forms of dental fluorosis. The dental fluorosis factor interests me as I have suggested that, in areas of endemic fluorosis, the physical appearance of defective teeth could lower quality of life and cause learning difficulties which are reflected in lower IQ values (see Severe dental fluorosis the real cause of IQ deficits?, Severe dental fluorosis and cognitive deficits – now peer reviewed and Free download – “Severe dental fluorosis and cognitive deficits”). I think that this is more reasonable as a mechanism than the chemical toxicity mechanism that almost all authors of these sorts of papers assume – but never support with any evidence. Even when dental fluorosis is considered it is usually treated as an indicator of lifetime intake of fluoride (which it is) rather than and independent cause of low IQ. Most studies like this seem to be motivated by confirmation bias. Despite the possibility of a range of factors being involved, and some of these such as parental education being a more obvious cause, there appears to be an urge to interpret data as evidence of a chemical toxicity mechanism involving fluoride. And there is never any experimental work to confirm this preferred mechanism. To my mind, if fluoride is implicated in the low IQ values the mechanism involving effects of dental fluorosis on quality of life and learning difficulties appears more credible than an unproven chemical toxicity. Note: None of this is directly relevant to areas where CWF is used. The prevalence of more serious forms of dental fluorosis is very small in these areas and not related to CWF. Also, no study has yet found an effect of CWF on IQ. Given the higher levels of fluoride used in the studies from areas of endemic fluorosis, and the higher levels of serious forms of dental fluorosis, extrapolation of the results to areas where CWF is used is completely unwarranted. Last May I raised the possibility that the much touted relationship of small IQ declines for children living in areas with naturally high fluoride in drinking water could be associated with severe dental fluorosis and not a chemical neurotoxicant (see Confirmation blindness on the fluoride-IQ issue). In November I repeated this argument because the recently published work by Choi et al (2015) provided evidence of a statistically significant relationship of cognitive deficits to severe dental fluorosis for Chinese children living in high fluoride areas (see Severe dental fluorosis the real cause of IQ deficits?). Perrott, K. W. (2015). Severe dental fluorosis and cognitive deficits. Neurotoxicology and Teratology. “Tooth decay and other oral defects negatively impact a child’s quality of life as assessed by children and parents (Barbosa and Gavião, 2008; Nurelhuda et al., 2010; de Castro et al., 2011; Aguilar-Díaz et al., 2011; Biazevic et al., 2008; Abanto et al., 2012; Krisdapong et al., 2012; Bönecker et al., 2012; Locker, 2007). Quality of life impacts have also been found for dental fluorosis, but there is a marked difference in physical appearance and quality of life assessments for children with moderate/severe dental fluorosis compared with those having none/questionable or very mild/mild forms. The physical appearance of moderate and severe forms of dental fluorosis is generally considered undesirable so we could expect these forms to be associated with poor quality of life and this appears to be the case (Chankanka et al., 2010; Do and Spencer, 2007; Chikte et al., 2001). In contrast, most studies report no effect or a positive effect of questionable, very mild and mild forms of dental fluorosis on quality of life (Do and Spencer, 2007; Chankanka et al., 2010; Peres et al., 2009; Biazevic et al., 2008; Büchel et al., 2011; Michel-Crosato et al., 2005). My purpose in this letter was to argue that other mechanisms besides chemical neurotoxicity should be considered in these studies. I hope researchers take this on board and look forward to the response of Choi and her co-workers to this suggestion. Health Effects of Water Fluoridation: a Review of the Scientific EvidenceDid the Royal Society of NZ and the Office of the NZ Prime Minister’s Chief Science Advisor make a big mistake in their report Health Effects of Water Fluoridation: a Review of the Scientific Evidence)? Did they misrepresent a scientific paper which reported an effect of fluoride on the IQ of children? This is what “Connett’s Crowd,” anti-fluoridation activists and propagandists, are saying in their attempts to discredit the review. So, did this review make the mistake its critics claim? Well, no. It’s just a beat up. But there is a small mistake in the review’s executive summary which the anti-fluoridationists are pouncing on. (Their use of “standardised weighted mean difference” was poorly explained and has caused confusion with many readers. See below for a brief explanation of the term). What did the Royal Society Review say about this? So, the review reported the Choi et al., (2012) findings accurately but made a small mistake in the executive summary. This is really of no consequence because the overall message of the small size of the estimated IQ drop (described by the authors as “small and may be within the measurement error of IQ testing”) is not really altered. What do the anti-fluoride critics say? Such mistakes are inevitable and authors will universally say they usually find them only after publication when no correction is possible. I remember picking up 5 mistakes in one of my papers – mainly incorrect spelling of my own name several times and a mistake in the address of my institution – those were the early days of word processing! Of course no one used my mistakes to cast doubts on the scientific content of the paper. Gluckman and Skegg (sic)* mistakenly claim “a shift of less than one IQ point” in the 27 studies reviewed by Choi et al. (2012). What they have done here is to confuse the drop of half of one standard deviation reported by the authors with the actual drop in IQ, which was 6.9 points. Such an elementary mistake would not have been made by Gluckman and Skegg (sic)* if they had actually read the report, instead of relying on what fluoridation propagandists were saying about it. * Of course Gluckman and Skegg – who Connett calls The ‘Hollow Men’ of New Zealand – did not author this review. I guess critics should read carefully before indulging in such snaky comments. All they have demonstrated is that they did not read past the executive summary of the review (and certainly did not read the relevant section in the review). Or, more seriously, that they wish to misrepresent the review by highlighting the mistake and ignoring what the review actually says. Update: One of my commenters, picker22, has brought this to our attention – it puts the mistake mentioend above into context. “The original press release from Harvard School of Public Health News service made the same error stating that the difference was .5 IQ points. This error on the part of Harvard led to more that a couple of mis-statements by fluoridation advocates in the US. The current web page notes that the sentence reporting the magnitude of IQ change was “updated” Sept 5, 2012. Sadly, I didn’t copy the original. Is Choi et al (2012) relevant to fluoridation? The only study specific to community water fluoridation (CWF) the Royal Society review mentions is Broadbent, et al., (2014). Community Water Fluoridation and Intelligence: Prospective Study in New Zealand. The Choi et al., (2012) paper reviews reports mainly from areas of endemic fluorosis where fluoride intake is much higher than areas using CWF. Subsequently the same authors made their own measurements in a similar area of China and did not find a significant relationship of drinking water fluoride to IQ (see Choi et al., 2014. Association of lifetime exposure to fluoride and cognitive functions in Chinese children: A pilot study). The did, however, find a relationship of IQ to severe dental fluorosis. I discuss their findings in my article Severe dental fluorosis the real cause of IQ deficits? This term caused a lot of confusion with readers and critics. Choi et al., (2012) used this statistical device because they were attempting to estimate the average decrease in IQ associated with fluoride exposure based on the difference in IQ between children from high fluoride villages and low fluoride villages in a large number of studies. Further, different IQ scales and measurement methods were used in the different studies which had different levels of variation in the data. They therefore standardised the differences by expressing them as a fraction of the standard deviation for each study. A mean value over all studies was determined, weighting the contribution from each study according to the precision of the IQ measurements.